Home » Blog » Where to eat at night in Hanoi? When the lights on street turn on, the night is coming and not easy to find a crowded street vendor for you in Hanoi such as: Cam Chi street, Lan Ong or Cau Go street. 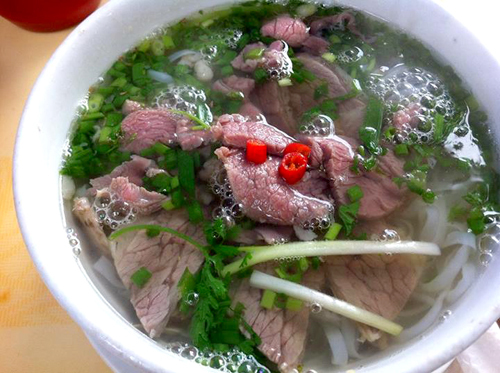 As you know, Pho Hanoi is very very famous and delicious, you can see Pho everywhere from suburbs or in the city but if you want a really Pho, i think no place to eat could be delicious as Old Quarter. They are Pho Mau Dich on Ly Quoc Su street, Pho Tu Do at Cau Go street, Pho Thin at Lo Duc, Pho at Hang Ma and Hang Dong. If you are finding a supper, should be come to Hang Buom or Tran Quang Khai. There are also some cheap and delicious suppers such as: Bun bo ( beef ), Bun Mang Ngan ( duck ), Chicken porridge… at Cua Nam or nearby Tran Quy Cap train station, on Hai Ba Trung street or To Hoang. 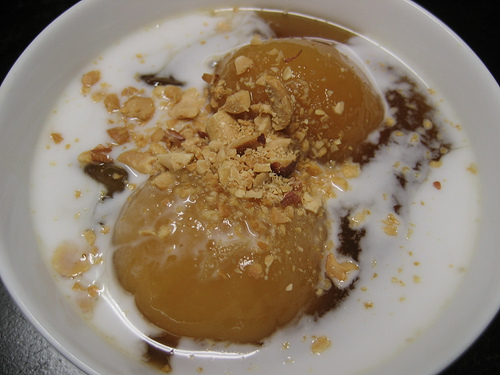 If you have a chance to visit Hanoi or you are being in Hanoi, you shouldn’t forget the cuisine street named Cam Chi. I still remember the feeling of hot porridge with spice, onion and pepper will take the cold of Hanoi winter far away. How could I forget the delicious fried rice on this street, Ma May and Hang Dau street are also famous with it. For a snack at night, why don’t you try Nom Bo Kho ( dried beef salad ) at Hoan Kiem street. Simple ingredients: fresh papaya, carrot and beef fibers with some herb or chopped fried peanut.. Hmm… It’s so cheap, about 15.000 VND – 20.000 VND. Do you know grilled dried squids? Like them? Visit Hang Gai and Luong Van Can street . You could find about 20 vendors there. How about grilled Chicken leg ( could it this thing? OF course! ), I love this food, enjoy with special sauce. They are sold on Hang Dau str and Mai Hac De. Walking along Lan Ong street, Cau Go to taste food on foot: Bun Thang, Pho Tron, Van Than vermicelli and breads. Step to Gam Cau street, there’s full of smell of BBQ organ and beef. Don’t like them huh? Walk for a while to Tam Thuong to taste Nem chua ran, walk through To Tich to enjoy some fruit juice or Hang Than street for Caramen. At the winter, Hanoi is also full of popular foods at night such as: corn, snail, Quay or banana cake… Step out! And walking along street, see crowded street in the cold air of the winter in Hanoi. Take a breath and listen the sound of bikes, the smile of people who in the street vendors. There are some “cheer”. Walking around and smell foods, and talk to your self what is it? It’s Hanoi! Unique cuisine and culture of this city for a long time as its age. Find the lonely feeling on crowded street in cold days, find the warming of the fire at BBQ street vendors. Find the smile of couple who are happy!